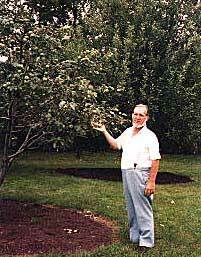 The apple trees just keep growing and growing and require pruning each year. Apple spurs are long-lived (about 7 to 10 years depending on the variety) and they grow about 6 to 8 feet per year. Most of the trees were planted in 1981 through 1984. Several were lost to Fire Blight and weather. In 1992, I planted a Red and a Yellow Delicious. So far the Red has done nothing but the Yellow is "Golden". Then in 1994, I planted a Cox Orange and Gala both have proven productive. We should not need to plant any more for a while. Although I am considering another dwarf pear and in 1997 I planted a Colette Pear (which was rubbed to death by deer) and a 5-in-one dwarf apple which has survived. Then in 1997 (late winter) we placed two hives of honey bees on the roof to help pollinate the trees. The first spring, (1998) was not too good but the bees realy took hold the following year. I'll be putting up the results for 1999 and 2001 soon. They, plus the three Apricots and two Cherries keep us busy along with special visits to the local schools. Built in 1980 during the oil crisis, the house is constructed with "Solarcrete" (an experimental material like "Gunnite" that is sprayed to form swimming pools) sprayed over a polystyrene shell which formed an effective sandwich of insulation inside the concrete. The roof is 84 yards of re-enforced concrete made in one continuous pour. Moisture is sealed out by Bentonite sheeting to form an effective moisture barrier from the earth. Bentonite clay is a mined and process clay material often used in man-made lakes to prevent the water from seeping into the earth. It is also that stuff used in Kitty Litter. With no furnace (only a wood burning stove) and no air conditioning, the house temperatures ranges from 75 degrees F in the summer to 65 degrees F in the winter (+ or - 4 degrees). The temperature change is about 1/2 degree / week. This side view of the house shows the earth on the roof and the back wall a bit better. We have added house construction photos and internal photos. Pictures and construction shots are shown in these links. Other areas you may want to see are linked to this page give specific contact addresses and organizations.